One of the finest dry Riesling we tasted last year proved to be this late-released effort by Clemens Busch. Here some background on this amazing wine. One of these wines proves to be the stunning, late released, 2015er Pündericher Marienburg Fahrlay Terrassen GG by Clemens Busch. 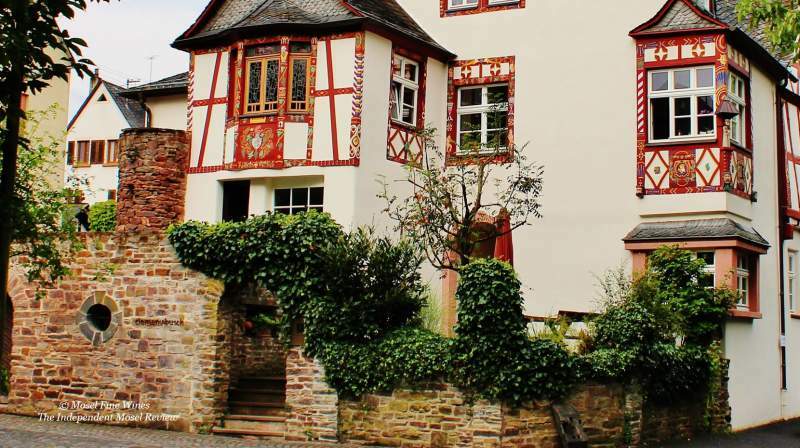 The Busch name is deeply rooted into the Pünderich DNA: Records as far back as 1663 already mention a Busch owning this beautiful house on the shores of the Mosel which seems to come straight out of a Hansel and Gretel story. 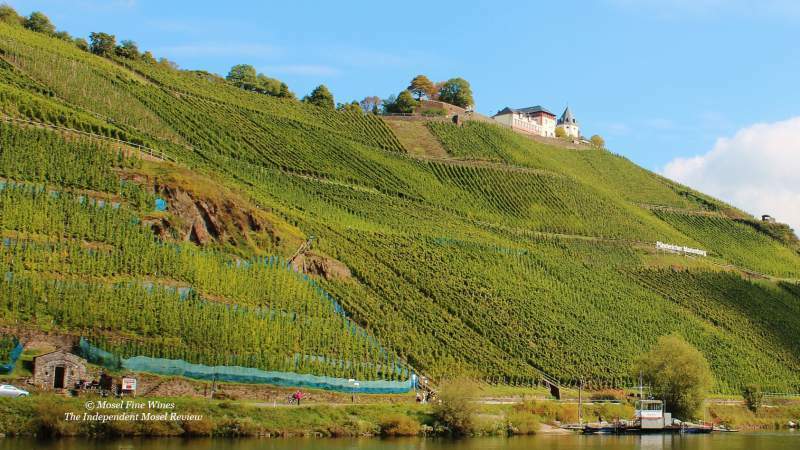 Weingut Clemens Busch has been one of the success stories in the Mosel of the last decades. Starting from humble origins with less than 2 ha in the 1970s, Clemens and Rita Busch steadily transformed their small family Estate into one of the finest Estates in the region. Clemens Busch has been one of the pioneers in the region. Soon after he joined the family Estate in 1974, he experimented with organic growing and became one of the founding members of the German organic grower association in 1986. “I did not take the organic route out of principles. It is more something which grew steadily over time, as I was seeing the positive effects it had on my vineyards and my wines.” He has gradually embraced biodynamic principles since 2005 and has been fully certified since the 2015 vintage. He painstakingly extended his holdings in the finer parts of the Pündericher Marienburg, thereby taking advantage of the general desire of local growers to go for flatter land and cash in on the new craze for red wine which engulfed the Mosel back in the 1980s. Today, the Estate extends over 16.5 ha of vineyards, almost all situated in Pünderich (just a few parcels are on the other side of the border to neighboring villages). The house style was built on late harvesting, long pre-fermentation cold soak (up to 12-24 hours) and extensive aging in Fuder oak casks. This has earned the Estate much respect and a loyal following which admired the often powerful and always very intense wines. Unsurprisingly, it was only the second Estate from the Terrassenmosel asked to join the exclusive VDP association in 2007. Lately, the style has gained in finesse, dryness and precision. As Clemens explained, "We did not change anything radically but I see a few things which contribute to this. My grapes grown biodynamically develop less alcoholic strength. I also prefer nowadays that my wines do not undergo malolactic fermentations. For instance, the 2015er Fahrlay Terrassen has not done any malolactic fermentation. Also, we no longer are the latest to harvest in the village as I want to keep some freshness in the grapes." The portfolio of dry Riesling is somewhat elaborate at this Estate: It produces no less than six different top dry Riesling from its holdings in the Pündericher Marienburg. The reason for this lies in the unique diversity of terroirs within the Marienburg vineyard. Its position at the border to the Wittlich trough makes it reveal many different geological formations. The result is that the Marienburg vineyard is really composed of three different terroirs, namely (from west to east) red slate, grey slate (the typical Terrassenmosel sandstone-like slate) and blue slate. 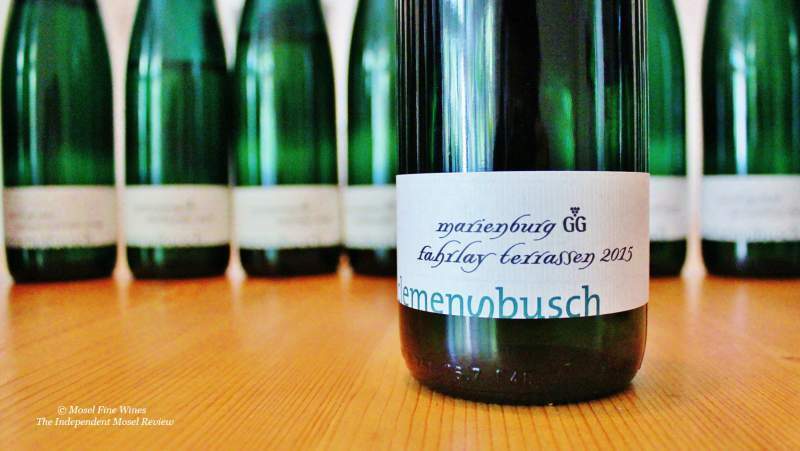 Clemens Busch has decided to respect these terroirs and structured his portfolio of dry Riesling accordingly. The GG Rothenpfad comes from the red slate sector, the GG Falkenlay from the grey slate one and the GG Fahrlay from the blue slate one. In addition to these three GGs, the Estate also produces special dry Riesling from each of the terroirs, made from the oldest and often terraced parts. These wines are then aged extensively (2 years usually) in traditional cask and may or may not complete their fermentation within the legal limits for dry Riesling. This includes the Fahrlay Terrassen, which comes from the terraced part of the Fahrlay vineyard which is still planted with 100 year-old un-grafted vines (on the left on the picture above). The 2015er version, released in 2017, proves simply mind-blowing. Far from showing some of the power and heat of the 2015 vintage, this wine is focused, composed and superbly elegant on the palate. Simply put, it is one of the finest young dry Riesling we have ever tasted from the Mosel. A true classic in the making. Overall, Clemens Busch outdid himself in the last two vintages. Not only its dry Riesling are among the finest in the country. Also its fruity wines were remarkably playful. All in all, this is an Estate which has established itself in the top league of Riesling growers. If you did not have it yet on your radar, now is the time to give this fine Estate a go! The 2016er and late released 2015er / 2014er wines by Clemens Busch were reviewed in the Mosel Fine Wines Issues No 38 (Oct 2017). You are a subscriber and miss this Issue? Simply send us a request by email and we will be happy to send you a copy. You are not yet a subscriber and wish to get this Issue? Subscribe free of charge by registering yourself here below and ask us for a copy by email.